Place: MRC/CSO Social and Public Health Sciences Unit, University of Glasgow, top floor, Herald Building, 200 Renfield Street, Glasgow, G2 3QB (map). Summary: Public health research faces major challenges that cannot be addressed effectively with straightforward interventions, such as combatting the spread of obesity. As a result the field of complex systems science, and related methods like agent-based models (ABM), have become increasingly popular as a means to understand these difficult issues. However, building an ABM is markedly different from building a mathematical model, and frequently the two approaches are best used to answer entirely different kinds of research questions. In this talk I will outline the theory and practice of ABM, and discuss how computational and statistical approaches can work together to help us understand and address complex public health challenges. Registration: Please register to attend using the button below. Will Statistics get caught out by a data backlash? Time: 13:00-14:00, (comprised of a 20-minute talk which allows for discussion and conversation after). Feel free to bring your lunch with you. Place: Boyd Orr Building, Room 412. Come and hear from Hetan Shah, executive director of the Royal Statistical Society about the issues in the wider data landscape, and how the RSS is responding. It will be an informal event, with plenty of time for discussion. Speaker: Laura Bonnett, NIHR Post-Doctoral Fellow in Biostatistics at the University of Liverpool and STEM ambassador. Time: 17:30-18:30, Preceded by the very brief RSS Glasgow AGM and followed by drinks and nibbles. The Sustainable Development Goals were designed to finish the job that the Milennium Development Goals began, with a particular focus on Leave No One Behind. Alongside the policy step change, the data needs of the SDGs are also a significant step change - moving from 8 to 17 goals and increasing the number of indicators to be measured from 60 to over 230. Three years into the 15 of the SDGs some of these indicators (tier 3) still remain undefined, and even for those indicators with clear methodology and tools to collect them are a challenge in developing countries. Leaving No One Behind adds a layer of complexity to these by requiring disaggregation of the data in several dimensions. Kim Bradford Smith will talk about the challenges of disaggregation and what the UK Department for International Development are doing to help improve disaggregation and create a real focus on the most vulnerable across the globe - such as those with disabilities. Hannah Worthington will talk about using cohort effects in population models for grey seals to identify reasons for apparent delay in first-time breeding. Hannah will also discuss the difficulties in estimating the total population size of injecting drug users, along with one possible solution. Speaker: Martin Hendry is Professor of Gravitational Astrophysics and Cosmology at the University of Glasgow, where he is also Head of the School of Physics and Astronomy. His primary research interests lie in gravitational-wave astronomy, and more broadly in the application of innovative methods to characterise and correct for observational selection effects in astronomical data sets. He is a member of the LIGO Scientific Collaboration, a global team of more than 1000 scientists leading the search for gravitational waves, and he is currently chair of the LSC’s Education and Public Outreach group. Place: Room 116, new Mathematics & Statistics Building (which looks like this), University of Glasgow, University Place, Glasgow G12 8SQ (C3 on campus map). Summary: On September 14th 2015 the twin LIGO observatories in Louisiana and Washington state, the most sensitive scientific instruments ever built, made the first ever direct detection of gravitational waves – tiny ripples in spacetime predicted one hundred years ago by Albert Einstein’s General Theory of Relativity and produced by the collision of two massive black holes more than a billion years ago. This remarkable discovery was widely hailed as one of the most important scientific breakthroughs of the century and led to the award of the Nobel Prize for Physics in December 2017. Since that first detection, several more black hole merger events have been observed, and in August 2017 the collision of two neutron stars was seen not just by LIGO – and its European counterpart, Virgo – but was also detected across the entire electromagnetic spectrum, opening an entirely new “multi-messenger” window on the Universe. Link to Professor Martin Hendry's talk at the National Physical Laboratory. Time: 14:00-15:00 followed by drinks and nibbles. Observational data are useful for studying comparative effectiveness or safety of medical treatments; however they are prone to bias due to confounders. Confounding bias arises when covariates which predict the outcome of interest have different distributions across treatment groups. Propensity scores (defined as the patient’s probability of receiving treatment conditional on their baseline characteristics) are becoming an increasingly popular method used to account for confounders. Conditioning on the propensity score balances the distribution of covariates across treatment groups and hence eliminates confounding bias. However, there is some debate as to whether propensity scores are reliable. One concern is that an inadequately estimated propensity score may not effectively balance covariate distributions, which could lead to biased results. There are a variety of balance diagnostics being used to assess the adequacy of propensity scores, but no consensus on the best method and the implementation in the applied medical literature is far from optimal. During this talk I will discuss reasons why some of the commonly applied balance diagnostics are not appropriate and highlight conflictions in the literature which could mislead applied researchers using propensity scores. Additionally, I will present a simulation study designed to compare diagnostics in terms of their ability to identify different types of propensity score misspecification. Results indicate that commonly used diagnostics such as standardised differences can be unreliable. Finally, I will discuss plans regarding development of new propensity score diagnostics. A network time series is formed of data collected over time at nodes of a graph, or network. These networks arise in a wide range of settings, such as environmental, financial, and medical.In this talk, analysis of a disease incidence data set is presented using the Network Autoregressive (NAR) framework. As an extension to the univariate autoregressive time series model, NAR allows for dependence on neighbouring nodes according the underlying network structure.The network associated with the time series could be un-weighted and un-directed, or have more complex features such as edge weights and directions, or even be time-varying. We demonstrate a method to recover an un-weighted graph from a multivariate time series using the NAR model. Advantages of using network-based methods for such data will be discussed, and performance compared to methods which do not use network structure. Place: Room LT908, Livingstone Tower, University of Strathclyde, G1 1XH (map). Summary: Those who value quantitative and scientific evidence are faced with many current challenges, including claims of a reproducibility crisis in scientific publication, and of a post-truth society abounding in fake news and alternative facts. Both issues are concerned with the appropriate acknowledgement of uncertainty, and both relate to trust in expertise. By considering the 'pipelines' through which scientific and political evidence is propagated, I will consider possible ways of improving both the trustworthiness of the evidence being communicated, and the ability of audiences to assess the quality and reliability of what they are being told. Speaker: Mark Brewer, Principal Consultant for Ecology & Environmental Science, Biomathematics & Statistics Scotland (BioSS). Place: Davidson Lecture Theatre, Room 208, Davidson Building, University of Glasgow, University Place, Glasgow G12 8QQ (B1 on campus map). Summary: Model selection is difficult, even in the apparently straightforward case of choosing between linear regression models. There has been a lively debate in the statistical ecology literature in recent years, where some authors have sought to evangelise AIC in this context while others have disagreed strongly. A series of discussion articles in the journal Ecology in 2014 (e.g. Murtaugh, 2014; Burnham and Anderson, 2014) dealt with part of the issue: the distinction between AIC and p-values. But within the family of information criteria, is AIC always the best choice? Theory suggests that AIC is optimal in terms of prediction, in the sense that it will minimise out-of-sample root mean square error of prediction. Earlier simulation studies have largely borne out this theory. However, we argue that since these studies have almost always ignored between-sample heterogeneity, the benefits of using AIC have been overstated. Via a novel simulation framework, we show that relative predictive performance of model selection by different information criteria is heavily dependent on the degree of unobserved heterogeneity between data sets. So we’re all data scientists now? Time: 17.30-18.30. Preceded by the very brief RSS Glasgow AGM and followed by drinks and (early) mince pies! Summary: What is data science? Why is it so hyped? 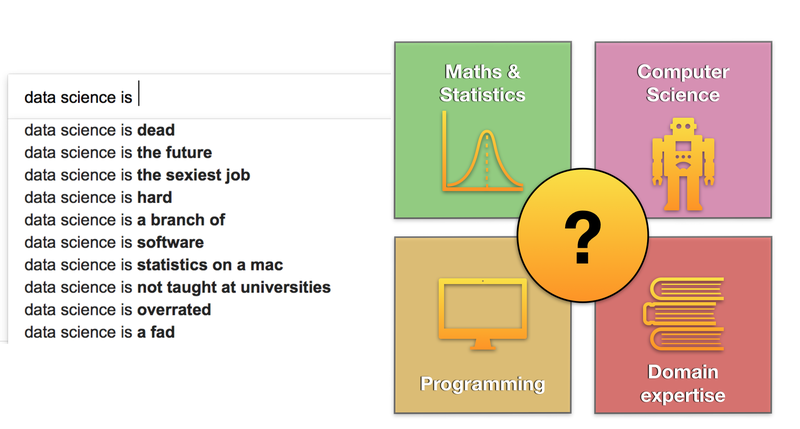 Where do statisticians fit in? The term data science was barely used 10 years ago, and now it seems to have subsumed every job involving data. This talk will explore the role of the data scientist and take a whistle-stop tour through the vast constellation of associated software and tools. Time: 17:30-19:00, followed by drinks and nibbles. Chris Robertson: Inequalities in HPV infection, vaccine uptake and cervical disease in Scotland - Trends in the uptake of HPV vaccination among girls aged 12-17 in Scotland since 2008 and its impact on cervical disease will be presented. The HPV vaccine prevents cervical cancer that has a higher incidence among women living in more socially deprived areas. The HPV vaccine is delivered in schools and factors affecting the uptake of this vaccine are investigated using spatio-temporal models. This analysis demonstrates low levels of inequality in vaccine uptake and that while the HPV vaccine is associated with significant reductions in both low- and high-grade cervical disease for all deprivation categories, the effect on high-grade disease was most profound among women living in the most deprived communities. Gerry McCartney: Why Scots die younger - This presentation will discuss the mortality patterns in Scotland and Glasgow over the last 70 years and draw together the extensive research that has been undertaken on the complex causes of these phenomena. The current mortality situation will then be discussed in light of the recent economic downturn and changes to the social security system, as well as legislative change targeting smoking and alcohol use. Speaker: Håvard Rue, Professor of Applied Mathematics and Computational Science, King Abdullah University of Science and Technology, Saudi Arabia. 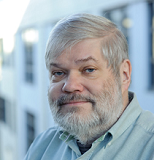 Håvard's research interests include Bayesian computing and spatial statistics, and he leads the development of the R-INLA package. He is visiting the University of Glasgow as part of the Isaac Newton Institute Talks Elsewhere initiative. Summary: Setting prior distributions on model parameters is the act of characterising the nature of our uncertainty and has proven a critical issue in applied Bayesian statistics. Although the prior distribution should ideally encode the users’ uncertainty about the parameters, this level of knowledge transfer seems to be unattainable in practice and applied statisticians are forced to search for a “default” prior. Despite the development of objective priors, which are only available explicitly for a small number of highly restricted model classes, the applied statistician has few practical guidelines to follow when choosing the priors. An easy way out of this dilemma is to re-use prior choices of others, with an appropriate reference. model component to be a flexible extension of a base model. Proper priors are defined to penalise the complexity induced by deviating from the simpler base model and are formulated after the input of a user-defined scaling parameter for that model component, both in the univariate and the multivariate case. These priors are invariant to reparameterisations, have a natural connection to Jeffreys’ priors, are designed to support Occam’s razor and seem to have excellent robustness properties, all which are highly desirable and allow us to use this approach to define default prior distributions. Through examples and theoretical results, we demonstrate the appropriateness of this approach and how it can be applied in various situations, like random effect models, spline smoothing, disease mapping, Cox proportional hazard models with time-varying frailty, spatial Gaussian fields and multivariate probit models, etc. Further, we show how to control the overall variance arising from many model components in hierarchical models. This is joint work with a lot of people related to the R-INLA project, and is still work in progress. Speaker: Professor Christl Donnelly, Imperial College London. Time: 17:30-18:30. Followed by drinks and nibbles. Place: Room 407, Boyd Orr Building New venue: Room 116, new Mathematics & Statistics Building (which looks like this), University of Glasgow, University Place, Glasgow G12 8SQ (C3 on campus map). Summary: Between December 2013 and April 2016, the largest epidemic of Ebola virus disease (EVD) to date caused more than 28,000 cases and more than 11,000 deaths in Guinea, Liberia, and Sierra Leone. Thorough analyses of these data have provided new insights into the epidemiology of EVD. Epidemiological analyses conducted during the West African epidemic have shown that large epidemics of EVD are preventable - a rapid response using classical approaches of EVD control can interrupt transmission and restrict the size of outbreaks, even in densely populated cities. Statistics are everywhere, from murder trials to playing the lottery. How can we identify patterns from ‘noisy’ data? Statistical experts demonstrate how to think mathematically about chance, risk and uncertainty. A joint event at Glasgow University consisting of two one-hour sessions aimed at senior secondary school pupils (S4 - S6), each focusing on different applications of statistical thinking. This event is being organised by members of the Glasgow local group of the Royal Statistical Society and Young Academy of Scotland in conjunction with the 2017 Glasgow Science Festival. Time & place: 10:00-12:00, Friday 9th June at the Wolfson Medical School Building, University of Glasgow, University Avenue, Glasgow G12 8QQ. Session 1 with Dr Liberty Vittert (lecturer in statistics at the University of Glasgow): "How to win the lottery and get away with murder." Statistics plays an incredible role in our everyday lives, you just don't know about it. From murder trials, to the lottery winner, to chances of survival with cancer, statistics and probability is in everything. Come find out how statistics and probability determines just about everything. School pupils will work in small groups to figure out statistical paradoxes presented during the lecture. Session 2 with Professor Christl Donnelly (professor of statistical epidemiology at Imperial College London and RSS William Guy Lecturer): The Ebola and Zika epidemics have brought infectious disease outbreaks into everyone's consciousness. The media images are of doctors and nurses in full body protection treating patients, but there are also important roles for statisticians analysing patient data. I explain epidemic growth – how diseases spread if each person infects two others, for example. I explain why Ebola is seen by many as a bigger global threat than malaria and why some diseases are easier to control than others (comparing SARS to influenza). The talk will be filled with examples of diseases including: BSE/vCJD, bovine TB, foot-and-mouth disease, SARS, influenza, dengue, MERS, Ebola and Zika. Who is this event for? : School pupils S4-S6. Pupils younger than 16 must be accompanied by an adult. Details and registration: follow this link. This event marks the 20th anniversary of the Comprehensive R Archive. Join us in person or via livestream as our three expert speakers and R users describe innovative and exciting uses of R in a wide variety of contexts. Time: 15:00-17:30 with a break for tea & coffee. Join us online via the livestream broadcast (see Registration below). Charis Chanialidis: Data visualisation & statistical modelling in Shiny. Shiny is a package from RStudio that provides a web framework for building web applications. Taking advantage of Shiny, R users can turn statistical analyses into easy to use interactive web applications. Thus, Shiny can be really helpful for engagement with non-statisticians or/and the general public. In this talk, amongst other things, I will show some of the applications I have created throughout the years and talk about some recent developments in Shiny. Mike Spencer: Predicting snowmelt with R. Snow is great fun, but it can also bring hazards. In this talk I’ll discuss how snow contributes to flood risk. The second largest recorded flood event on the River Thames was attributable to snow, following the harsh winter of 1947. Snowmelt is frequently part of river flows in colder parts of the UK, invariably these are further north than the Thames and the rivers begin in mountainous terrain. In Scotland the uplands are often used for water storage, e.g. for hydro-power and water supply. Structures, like dams, are used to retain water, but these structures were assessed for exposure to snowmelt risk using a fixed daily melt rate, which I will show can be exceeded. I used R to model the risks of snowmelt to reservoirs in Scotland. Colin Gillespie: 20 years of CRAN. The Comprehensive R Archive Network (CRAN) is 20 years old this year. This talk will discuss the past, present and future of this important R resource. Join us online via the livestream broadcast. Jane Hutton: Epidemiological evidence in civil legal cases - 'If anticoagulants had been administered sooner, my client would not have died.' 'This drug damaged the sight of my patient.' How much money should be awarded to a child who is disabled due to medical negligence? Should a teenager with cancer be given active treatment if doctors estimate he has two weeks to live? Statements and questions such as these are the basis of civil law suits, in which one party claims damages from a second party, or demands particular actions. Many lawyers still only request expert opinions from medical doctors. However, statisticians can contribute to civil law suits by finding evidence relevant to the particular case, evaluating it, and them presenting the information. Tereza Neocleous: Models for forensic speaker comparison - This talk will present ways in which statistical modelling can be used to evaluate the evidential value of voice recordings such as those occurring in hoax phone calls, calls related to extortion, fraud cases, or involving abuse or threats. Examples of how vocal features extracted from such recordings can be modelled to provide a measure of the strength of evidence will be presented, followed by a discussion of opportunities and challenges in this field in the era of big data. Place: Room LT908, Livingstone Tower, University of Strathclyde, G1 1HX. Summary:Coincidences happen, incredibly unlikely things occur, and the apparently miraculous comes about. The improbability principle says that extraordinarily improbable events are commonplace. It shows that this is not a contradiction, but that we should expect identical lottery numbers to come up, lightning to strike twice, to meet strangers with our name, financial crashes to occur, and ESP experiments to produce positive results. All of these and more are straightforward consequences of the five solid mathematical laws constituting the improbability principle. Ruth King, Thomas Bayes' Chair of Statistics at the University of Edinburgh. Diana Cole, Senior Lecturer in Statistics at the University of Kent. Time: 17:30-18:30, followed by drinks and nibbles. Place: Main Lecture Theatre (LT1), Graham Kerr Building, University of Glasgow, University Avenue, Glasgow G12 8QQ (map). ecapture data, where individuals may be recorded as being in different discrete states when they are observed. For example, this may relate to location, disease status, breeding status etc. We will show how these, often fairly complex, capture-recapture models can be expressed in the form of a general (partially observed) hidden Markov model (HMM). This permits a generalized framework for a range of different models, including likelihood formulation and associated model fitting techniques. Real examples will be used to demonstrate the different models. methods also exist, these can lead to the wrong conclusion. Models used in ecology are becoming more realistic but at the same time more complex. This poses a problem for this symbolic method as computers run out of memory calculating the rank of the appropriate matrix. An extended symbolic method exists but this is mathematically complicated. An alternative solution is a hybrid-symbolic numeric method. This method combines symbolic and numeric methods to create an algorithm that is extremely accurate compared to other numeric methods but is also more straightforward to use. We demonstrate the advantages of this method and show how it can be used in ecological models, such as capture-recapture models. Statistical experts Jennifer Rogers and Liberty Vittert describe how to think mathematically about chance and risk and how to unpick causality from noisy data in real life settings. This is a two-hour lecture aimed at senior secondary school pupils (S5 - S6), hosted jointly by Glasgow University and the Glasgow local group of the Royal Statistical Society as part of the 2016 Glasgow Science Festival. Time & place: 10:00-12:00, Wednesday 15th June at the Wolfson Medical School Building, University of Glasgow, University Avenue, Glasgow G12 8QQ. Dr Liberty Vittert: How to win the lottery and get away with murder. Statistics plays an incredible role in our everyday lives, you just don't know about it. From murder trials, to the lottery winner, to chances of survival with cancer, statistics and probability is in everything. Dr. Liberty Vittert is currently serving as the Mitchell Lecturer at the University of Glasgow. She has become a TV regular, both as The American Cook (making American-style cuisine with a bit of a mathematical twist), and as an expert statistician detailing the probabilities of certain event occurring such as the recent $1.6 billion Powerball. Come find out how statistics and probability determines just about everything. Dr Jennifer Rogers: Yeah, but is it significant? You've just tossed a coin ten times and eight of them were heads. Sunderland win their next five games of the Premiership season. In clinical trials for a new treatment for chronic headaches, 40% get better within 24 hours. But so what, sometimes these things happen just by chance, right? As a statistician, it is my job to decide whether any differences I see in data are likely to be just by chance, or whether they are 'statistically significant'. But how much evidence do you need before you can say that what you see is significant and how do you untangle causality from chance? Dr. Jennifer Rogers is a research fellow in the Department of Statistics at Oxford University with interests in statistical methodology and applications in health care. In 2014 she was elected the Royal Statistical Society Guy Lecturer, and can now be regularly found presenting in schools, pubs and on stage. Hadley Wickham is one of the most active and influential R developers in the world, and these talks should interest any serious R user. They are organised by the School of Mathematics and Statistics, not the RSS Glasgow Local Group. Thursday 28th April - Multivariate Models, Probabilities of Ruin & League Tables; so, are you paying too much for your Car Insurance? Speaker: John Birkenhead, is an independent consulting actuary. The winner of the 2015 Finance Monthly Global Awards for UK Actuarial Services, he specialises in the quantification and communication of risk. He is a STEM Ambassador, a Careers Ambassador for the Actuarial Profession and is a sought-after speaker at schools for enthusing careers in maths. It’s not always as cut and dried as you might think and this talk will explain what is going on! We will examine the theoretical statistical basis of risk (multivariate probability distributions), EU regulations concerning theoretical “probabilities of ruin”, theoretical “customer lifetime value” models as well as seeing the theories in action with some realtime examples from price comparison websites. We will also look at forward pricing, statistical quirks in the data and some pricing anomalies, all explainable from the theoretical considerations. So, are you paying too much for your car insurance? Come and listen to the evidence for and against, given by an experienced and independent actuary (and car insurer payer!) deeply involved in insurer pricing, solvency and regulatory management of insurers and draw your own conclusion! Twitter: Join the discussion and post questions using the hashtag #RSSGlaPremium. Speaker: Peter Diggle, President of the Royal Statistical Society (here's an interview with Prof Diggle, where he discusses his career and his vision for the RSS under his presidency). Summary: The rise of data science could be seen as a potential threat to the long-term status of the statistics discipline. I first argue that, although there is a threat, there is also a much greater opportunity to re-emphasize the universal relevance of statistical methods to the interpretation of data, and I give a short historical outline of the increasingly important links between statistics and information technology. The core of the paper is a summary of several recent research projects, through which I hope to demonstrate that statistics makes an essential, but incomplete, contribution to the emerging field of ‘electronic health’ research. Finally, I offer personal thoughts on how statistics might best be organized in a research-led university, on what we should teach our students and on some issues broadly related to data science where the Royal Statistical Society can take a lead. Time: 15.00-16.00, followed by wine reception. This event is free. Members and non-members welcome. Twitter: Join the discussion and post questions using the hashtag #RSSGlaPres. Place: Room 203, Maths Building, University of Glasgow, G12 8QW (map). Further reading: articles about the mystery surrounding the fate of the Franklin Expedition disaster, from Significance magazine, the University of Glasgow and the Guardian. World Statistics Day was instituted by the United Nations General Assembly in 2010 to recognize the importance of statistics in shaping our societies. Find out more here: worldstatisticsday.org. Place: Ben Cruachan seminar room, MRC/CSO Social and Public Health Sciences Unit, University of Glasgow, top floor, Herald Building, 200 Renfield Street, Glasgow, G2 3QB (map). Summary: The aim of many research areas may involve the study of how the effect of a particular exposure on the outcome of interest is mediated by intermediate factors. Although the study of mediation is well established in the social and behavioural sciences, and often loosely attempted in epidemiology, developments in modern causal inference have highlighted the limitations of these 'classical' approaches and led to new definitions based on counterfactuals and novel estimation methods that deal with specific challenges such as intermediate confounding. In this workshop we will present and compare these two approaches and stress the greater rigour and generality permitted by the potential outcomes framework. Speaker: John Curtice is Professor of Politics at the University of Strathclyde and "the doyen of political polling" (Financial Times). He writes a blog providing observations and analysis on the state of public opinion in Scotland. Summary: The 2015 election looks as though it will join the 1970 and 1992 contests as elections when the polls were perceived to have got it ‘wrong’. Although on average the polls were no more than a percentage point adrift in their estimates of support for the smaller parties, they suggested that Labour and the Conservatives were in a dead heat when, in practice, the Conservatives proved to be nearly seven points ahead. Only when the results of the BBC/ITV/Sky exit poll were released did the first intimation come that in fact the Conservatives were well head. In this talk Prof. Curtice will describe how the polls were conducted and assess some of the possible reasons why they overestimated Labour and underestimated Conservative support. Prof. Curtice is giving this talk in a personal capacity, and not in his role as President of the British Polling Council. Join the discussion and post questions for Prof. Curtice on twitter via the hashtag #RSSGlaPolls. Speaker: Robert Grant, senior lecturer in health and social care statistics, Kingston University and St George's (Medical School), University of London. Time: 17:00-18:00, followed by drinks and nibbles. Join the Webinar. Update: follow the event on twitter and join the post-seminar questions using the hashtag #gladataviz. Summary: The last few years have seen an explosion of innovative data visualisations, particularly those that are interactive and delivered online. These have the potential to make our work have much greater impact but are a mystery to most statisticians. I will describe how I learned about these: how to design them and how to make them. I will reflect on the differences between the worlds of data and design, and present some current experiments in representing uncertainty in more intuitive ways for a lay audience. rather bizarre home remedies. Martin was advisor and statistical analyst for four clinical trials in this series. He will talk about how this came about, describe each of the trials, their sometimes surprising results and how they were presented, and his seconds of televisual fame. Time: 17:00-18:00 ***Note later time than originally advertised*** Preceded briefly by RSS Glasgow Group AGM, and followed by drinks reception and nibbles. What are the origins of Naismith's rule? What is the connection between the rule, the treadmill crane at Harwich, and the Scottish Mathematician MacLaurin? Can N be estimated from data? Does N vary with age, that is, do veteran runners find ascent relatively more difficult, and therefore should they be more inclined to go around? If the over and around routes between points on opposites sides of a simply shaped hill are equivalent, is there a quicker route in between? What is the shape of an isochronic hill? Is the rule applicable to cycling? Time: 5.30-6.30 pm, followed by drinks and nibbles. Friday 12th September: Quantifying the impact of air pollution on health. A workshop aiming to bring together academics, policymakers and other interested parties to discuss this important public health issue. Place: ***New venue due to high demand*** Hugh Fraser Seminar Room 2, Wolfson Medical Building, University of Glasgow, Glasgow G12 8QQ (C8 on campus map). Summary: Scotland has some of the best administrative data in the world (e.g. health, social care, housing, education and criminal justice). However, these data are not being fully exploited: to ensure our social policies are designed to respond to multiple disadvantage; our public services are as efficient as possible; and that these data are mobilised to support economic growth. This lecture will explore some of the reasons for the under-utilisation of administrative data and chart some of the new initiatives which aim to release these data's potential. Speakers: Ade Kearns and Julie Clark of the University of Glasgow. Summary: The GoWell East study aims to consider the effects that regeneration and the Commonwealth Games 2014 might have upon the quality of life and health and wellbeing of residents living in the six communities nearest to the main Games sites in the East End of Glasgow. This talk will describe the approach we are using to do this, within the three broad legacy domains of economic impact, sports participation and physical activity, and sustainability. Broadly, the methods comprise: a longitudinal survey of an adult resident cohort; a longitudinal survey of a pupil cohort; stakeholder interviews and workshop; qualitative interviews with residents; and an ecological study of secondary data on the physical, economic and social environments. At present, we are conducting a prospective assessment of the potential for intervention impacts within and upon the study area, and the framework used for this will be explained. Time: 15.00-16.00, followed by drinks and nibbles. The time is unchanged: 13.00-16.00. Read the article "Statistics making an Impact"
Summary: John Pullinger, President of the Royal Statistical Society will give a reprise of his presidential lecture. 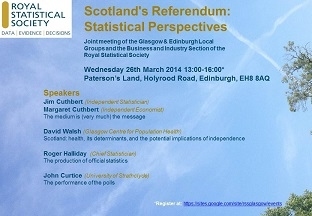 He will explore how the role of statistics in society has changed with changes in the politics of decision-making. He will outline the Royal Statistical Society strategy for the next 4 years and consider how individual members of the RSS can play a part. Time: 15.00-16.00, followed by wine reception.This event is free and open to all. Non-members welcome. Tuesday 17 December 2013 - Seminar: Public Engagement: Some Perspectives from Statistics and Public Health. Followed by RSS Glasgow Group AGM. Summary: Engaging the public with our research and work is challenging. We have created 3 activities and trialled them with members of the public (aged 7-70) at the Glasgow Science Centre. We will discuss how we developed these activities (Inequalities in Mortality Mountain Plot Jigsaw; Design a Healthy Lifestyle app; Health in the City Game) and then you will have the opportunity to try the activities. Followed by wine, nibbles and mince pies. Event is free and open to all, in particular non-members. This event is part of the International Year of Statistics (Statistics2013). 14 October 2013 - Meeting: Expert Judgement. Joint meeting hosted by the Glasgow Local Group of the Royal Statistical Society and the Operational Research Group of Scotland at the University of Strathclyde. 16.00: Prof Tim Bedford (University of Strathclyde). Using Expert Data in Uncertainty Modelling –Theory, Methodology and Practice. 16.45: Dr John Paul Gosling (University of Leeds). Helping Defra estimate the cost of animal disease. Time: 16:00-17:45 on Monday 14 October 2013. Place: Room LT908, Livingstone Tower, University of Strathclyde. 25 June 2013 - RSS/GSSG Seminar: White Flight & Social Segregation. This seminar is jointly funded by the Royal Statistical Society Glasgow Local Group, AQMEN/Glasgow Social Statistics Group and the School of Social and Political Sciences, University of Glasgow. Time: 14:00-16:00 on Tuesday 25 June 2013. 23 May 2013 - Seminar: 30 years of adolescent health: The Health Behaviour in School-aged Children study, 1983-2013, methods and findings. This event is part of the International Year of Statistics (Statistics2013). Speakers: Dorothy Currie and Kate Levin, Child and Adolescent Health Research Unit, University of St Andrew.